The 1,000 tonne, 180-metre long machine will start constructing the Shieldhall Tunnel in the south of Glasgow next year. It is currently in Germany at manufacturer Herrenknecht and its construction recently reached a crucial stage when the cutting head was installed and tested, watched by representatives of Scottish Water’s project team. Weighing more than 50 tonnes, the TBM will be shipped in several components to Scotland and re-assembled. The £100m tunnel will be more than three miles long and 4.7 metres in diameter. It is being constructed by the Glasgow Tunnel Partnership, a joint venture of Costain and VINCI Construction Grands Projets called CVJV, working with local partners George Leslie and AECOM. Meanwhile, CVJV’s preparatory work is progressing towards completion next spring in advance of tunnelling work proper. The structure is expected to be completed by the end of 2017. 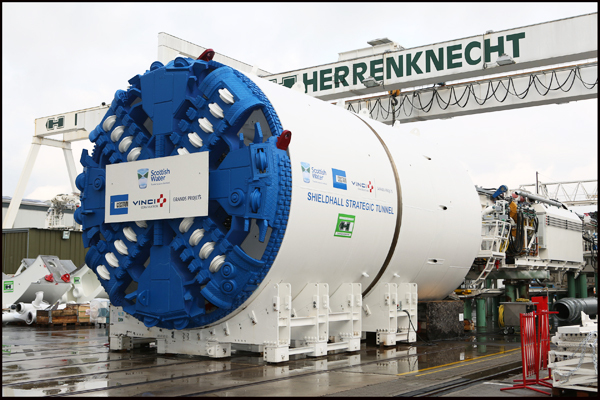 ♦ Herrenknecht TBMs are being used in London’s Crossrail project, one of Europe’s biggest construction projects, as well as the Doha Metro in Qatar, an undersea highway tunnel in Hong Kong, and the world’s longest railway tunnel in the Swiss Alps.